"In the uterus a baby will grow about 8000 new brain cells every second"
Our brains are so complex that they take over 20 years to fully mature. Although the brain continues to adapt and change throughout life, this ability decreases with age. It is most malleable early in life and less flexible as we age. Nurturing and predictable relationships help build babies brains. A baby’s brain begins developing long before birth. By around three weeks after conception a baby’s brain begins to form, and whilst in the uterus a baby will grow about 8000 new brain cells every second. Far from being a passive passenger while in the uterus, babies are busy learning about themselves and the world around them through their senses. The senses continue to develop after birth and the senses all work together to help develop an understanding of who we are, where we are and what is happening around us. 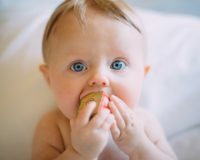 Senses of taste and smell develop next at around 12 weeks. Taste receptors can even pick up the mother’s dietary habits in the amniotic fluid. The vestibular sense, (i.e. balance) which provides a baby with information about the movement and position of its body within the uterus, develops at around 14 weeks. Through the vestibular sense babies can tell when their mother is walking, standing or lying down. Around the same time proprioception develops which helps a baby become aware of their body – his brain receives feedback from his joints, muscles and tendons which help him to understand where his body parts are in relation to each other and also informs his brain when and how his muscles are contracting or stretching, and when joints are bending, extending or being compressed. As your baby begins to move his limbs, each movement of the spinal cord causes his muscles to relax and contract. These movements are essential for the future activities of eating, drinking and breathing. Hearing begins to develop in the second trimester. Between 21 – 25 weeks a baby can hear and can startle at sudden noises. It is amazing to realise that a baby in the womb has already a clear picture of his parents and siblings speech and voice patterns which will bring a feeling of familiarity and comfort when he is born. Newborns will often turn their heads when they hear Mums or Dad’s voices. The last sense to develop is the sense of vision which develops in the third trimester at around 26 weeks. A baby sees shadows and its own limbs. These experiences prepare a baby to visually explore its parents’ faces and to begin eye to eye contact which is so important for the parent-child relationship, also known as attachment and social skills. At about 8 into the week's pregnancy a baby can feel their lips and cheeks and by around 14 weeks they can feel the rest of their body. Promptly responding to their baby’s needs. Observing their baby’s non-verbal gestures or signals (eg. a baby’s clenched fist and jerky arm movements may mean that their baby is tired) and responding appropriately. This may take time before parents get this right!